The sleeves and the neckline are done, and all the ends have been woven in; blocking and button-sewing will take place tomorrow. I’m pleased, but still a little apprehensive — blocking is the final technical element in my project, and requires some concentration. Can I stick the landing? Real photos to come on Sunday, weather permitting. I have total and complete faith that you will stick that landing 😀 I can’t wait to see the finished sweater – I know it is going to be beautiful…. fabulous !! 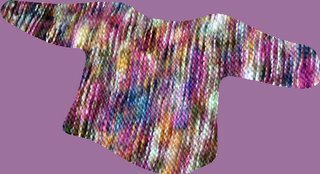 I just LOVE the way the colors dance all over the sweater!You have LOTS to be proud of – I’ll bet that this sweater will rapidly become your favorite! !